My question is: how can this mesh be correct (and how can the original mesh be incorrect)? This is a follow-up of http://www.cfd-online.com/Forums/ope...s-correct.html , where I had a AFAIKS correct mesh, yet checkMesh gave two errors. This resulted in a 'correct' (that is: according to checkMesh) mesh, with six faces, two of which are bent polygons. The image below shows the point indices, the others show the face indices. Of the bent polygon faces, I number the vertex indices. How can this mesh be correct (and how can the original mesh be incorrect)? Below I put the content of the AFAIK most important files, you can view all at http://www.richelbilderbeek.nl/ToolO...dCorrected.htm . The mesh has multiple regions which are not connected by any face. <<Writing region information to "1/cellToRegion"
Boundary openness (-2.28837e-018 -1.83069e-017 0) OK.
Max cell openness = 5.55112e-017 OK.
Max aspect ratio = 2 OK. Minimum face area = 1. Maximum face area = 2.23607. Face area magnitudes OK.
Min volume = 0.731939. Max volume = 0.731939. Total volume = 1.46388. 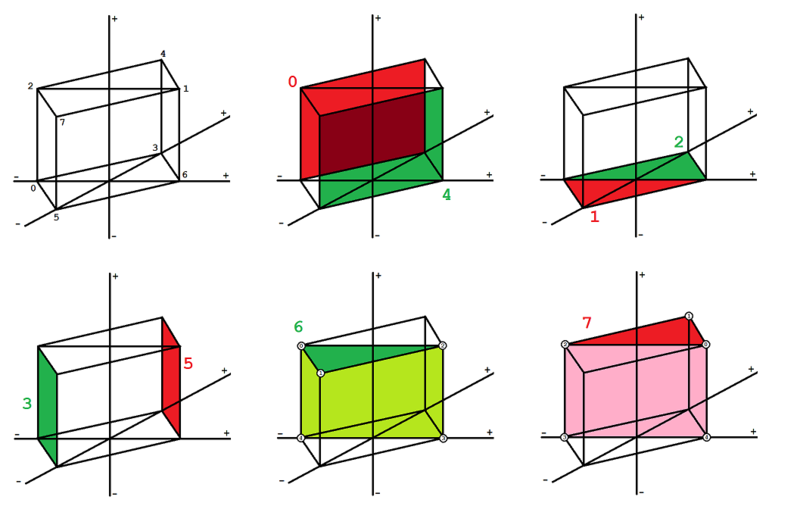 Cell volumes OK.
Max skewness = 0.34936 OK. The source error http://www.cfd-online.com/Forums/ope...s-correct.html has been solved and the answer can be found there.